The Anti-Austerity Alliance has announced that the party is changing its name to Solidarity. 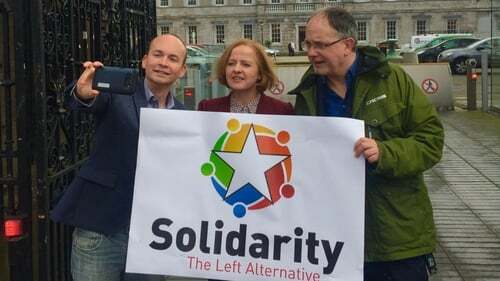 The party's three TDs Ruth Coppinger, Paul Murphy and Mick Barry made the announcement of the party's rebrand at a press conference in Dublin this morning. Ms Coppinger, a Dublin West TD, said the decision to change the name was made to reflect the "many movements emerging on workplace, economic and social issues". She said: "The AAA has played a key role in campaigns like the water charges and housing. Solidarity will continue to do so but the name will now better reflect our campaigning work on Repeal, LGBTQ issues and equality generally." Mr Murphy said the non-payment of water bills was an example of solidarity. Mr Barry said there is a big space opening up on the left in Irish politics. He said: "The policies of the extreme centre have delivered a housing crisis, a crisis in the health sector and a lockout of working people from the fruit of economic recovery." The party says the left-wing Dáil grouping currently known as the AAA-PBP will become known as the Solidarity - People Before Profit. The 'Solidarity' name change is currently being processed by the Dáil registrar and will shortly come into effect.